Home / GST / GST-Tally / What is Non - GST Supply & How to create Non GST Entry in Tally? What is Non - GST Supply & How to create Non GST Entry in Tally? In Schedule III of GST following two commodities are not covered under GST and both are non GST Supply whether both are Income / expenses / purchase/ sales. In GSTR - 3B and GSTR - 1 both have option to fill Non GST Supply in terms for filing the Return. You can see both options required Non GST Supply information. A registered GST assessee need to file Non GST Supply in both returns. For Example, If assessee spend Rs. 5000 for Car petrol then this is a non gst expense and it is mandatory to file this expense in Non GST Supply Section in GST Returns. 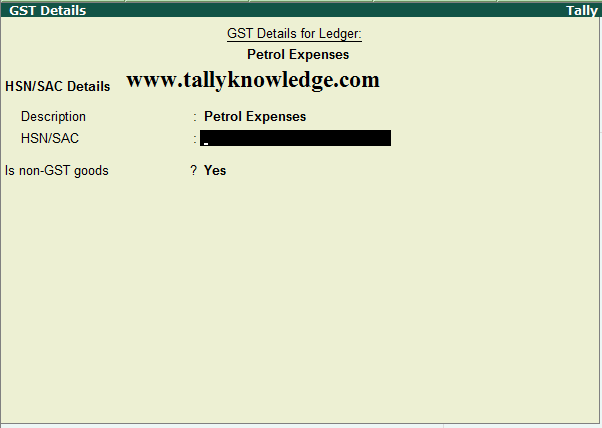 Now we learn how to pass Car Petrol Expenses in Tally and how to show it directly under Non GST Supply in GST Returns. This option will directly move your expenses to Non GST Supply. Create all expenses entry related to non GST Supply and export your GSTR Return. Import your data in Offline utility, check and validate the data in offline utility and Generate Json file. Import this Json file to Prepare offline mode. Watch following video for Non GST Goods.